The Eson 2 Nasal Mask - Fit Pack is an update to the original Eson Nasal Mask, and has many improvements over its predecessor. Don't know what cushion size is needed? No worries! The Fit Pack includes cushions of all sizes: small, medium, and large. The RollFit cushion is designed to help create a better seal and adapts to the contours of the face. It's lighter than the previous version and features a noise diffuser, eliminating much of the noise coming from the mask. A slim mask covering less surface area than its predecessor, the Eson 2 is a nasal mask designed to seal around the nose, keeping leaks in check quietly. It creates a quieter overall experience than the original through using a replaceable noise diffuser. The cushion is anchored in place by using a stabilizing forehead bar which provides additional support for the seal while allowing the cushion to adapt to changes in position. The Eson 2 cushion gently glides over the bridge of the nose, creating a fit designed to help reduce leaks. 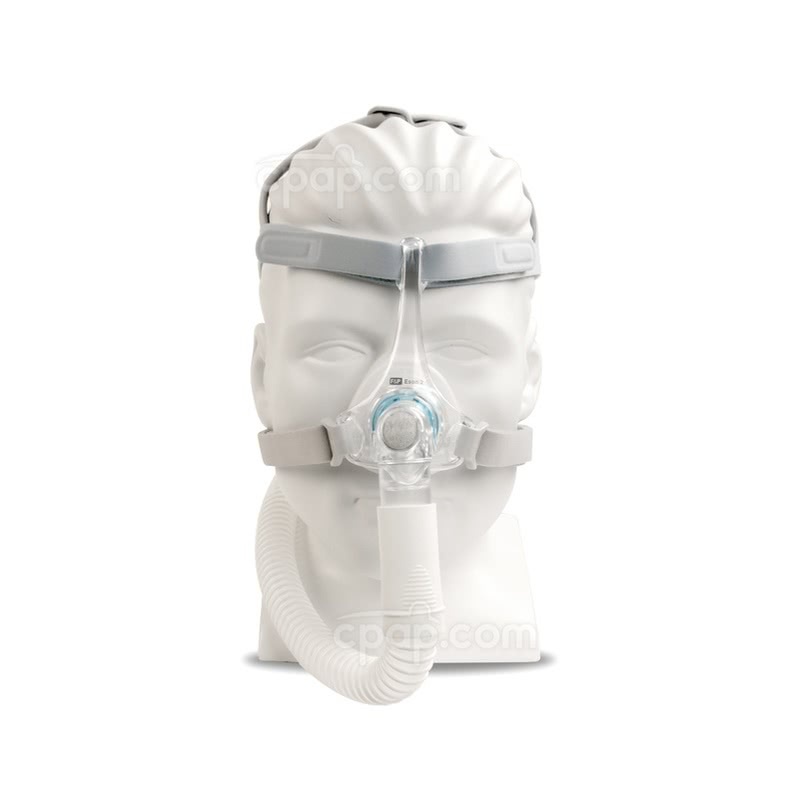 The RollFit cushion is similar in design to the cushion found on the popular Simplus mask. It's designed to be comfortable and stable, adapting to the contours of the face. The forehead support on the Eson 2 helps secure the cushion in place while giving it the flexibility to adapt to changes in position. The forehead assembly, in turn, can create a better seal than a mask without forehead support. 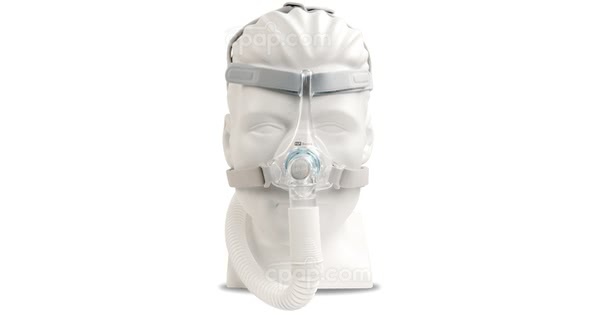 The Eson 2 covers less surface area than the original Eson mask. The original Eson was already considered slim in the first place, and the Eson 2 Nasal Mask has improved upon the original design. The slim profile creates an open view, offering greater visibility than its predecessor. With adjustment points on the forehead and straps near the touchpoints of the face, the easy-fit headgear can be quickly adjusted for optimal comfort. Tighten the forehead straps to anchor the headgear firmly and help get a better seal. Loosen as needed for improved comfort. Using a noise-reducing diffuser, the Eson 2 is designed to help reduce mask noise. The noise reduction is made possible by a diffuser of porous material, which works to dampen the sound of the noise as it exits the mask. This part is fully replaceable, improving the longevity of the mask. Don't know what size cushion is needed? The Fit Pack sold here includes cushions of all sizes: small, medium, and large. This is great for customers that are having trouble determining the correct size to order. Don't need all these cushions? 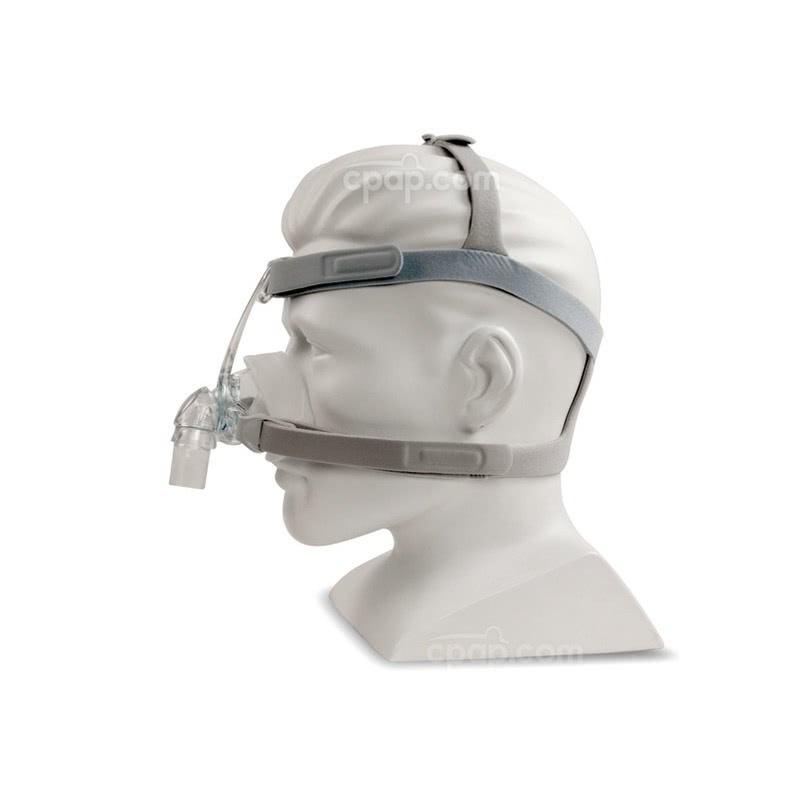 Consider purchasing the Eson 2 Nasal Mask in a selected size. Insert the round, plastic opening on the cushion into the round opening in the middle of the mask frame. Turn it to lock in place. Clip the diffuser on top of the mask elbow, while attaching the swivel to the bottom of the elbow. Connect the hose to the CPAP mask. Place the grey headgear straps through the headgear clips, closing the connection by applying the hook and loop fastener to the strap. Thread the pale blue straps through the back of the forehead support. Finish by wrapping the strap through the opening so the hook and loop closure falls onto the strap for easy closure. The mask must be pulled over the head and adjusted, with the goal of creating a comfortable, yet firm, seal. Ideally, one should hold the mask in place over the face and with the other hand, lift, pull, and place the hook and loop fastener on the blue straps until the fit is leak free, yet still comfortable. Continue this step with the other straps found on the mask frame. If further adjustments are needed, consider adjusting the forehead straps near the crown of the head. PLEASE NOTE: The blue headgear straps need to stretch above the ears when resting on the forehead. HEADGEAR SIZE: The headgear that ships with the Eson 2 Fit Pack is the medium/large version. 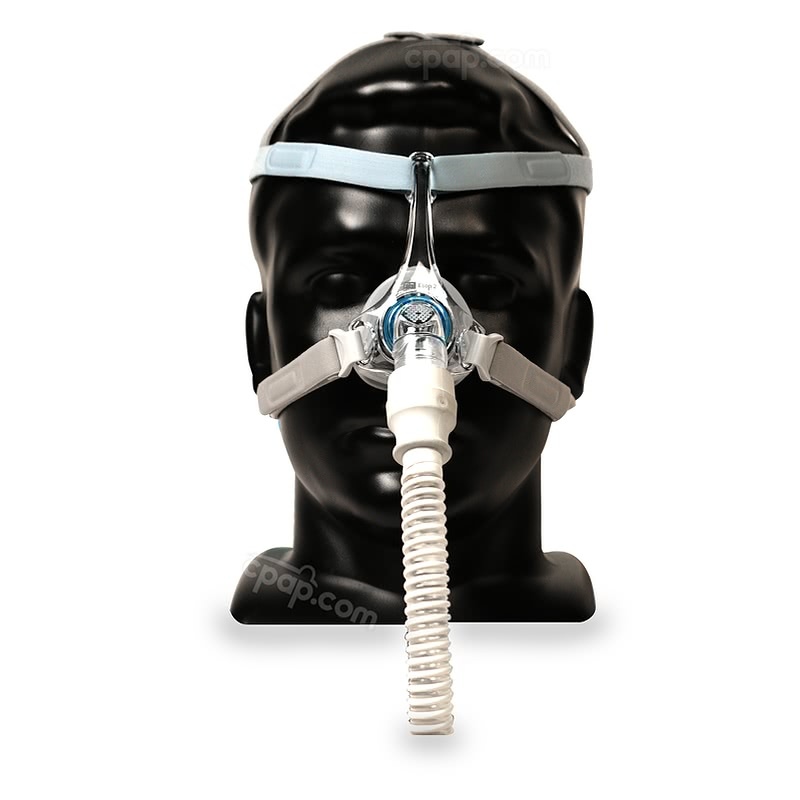 The Eson 2 mask frame is one size and accommodates all Eson 2 cushion sizes. The frame size is not stamped on the frame. An indention found near the top of the cushion has a clear letter embossed on either side of the silicone. The letters indicate size. The letter "S" stands for a Small, "M" stands for a Medium, and "L" stands for a Large cushion. The manufacturer recommends washing the Eson 2 mask, headgear, and diffuser in warm water with mild soap for 10 minutes or less. To prevent infections and improve the longevity of the mask, it should be washed each day. The headgear and diffuser should be washed weekly. When rinsing all items, ensure the soap residue is gone. Allow the mask and parts to air dry away from direct sunlight. WARNING: Do not use bleach or harsh chemicals to clean the mask, as this can pollute the air you breathe with toxic chemicals and could have dangerous consequences.